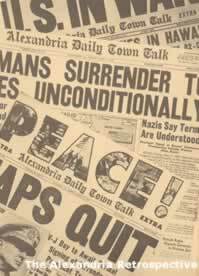 The areas surrounding Alexandria played key roles in the military buildup and soldier training for World War II. Because of its location in a sub-tropical climate, the U.S. Army built several major military camps in Central Louisiana. Another plus for the area was the availability of an additional 3,400 square miles of similar territory towards East Texas for war maneuvers. 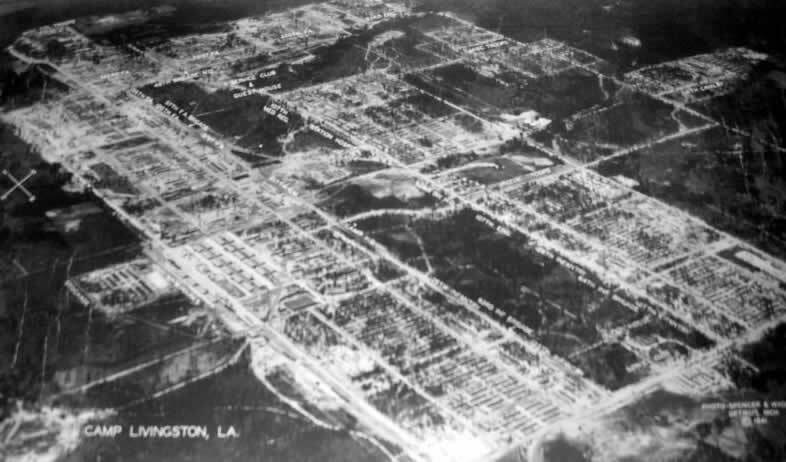 Within a 30-miles radius of Alexandria, the military constructed Camp Livingston, Camp Claiborne, Esler Field, Alexandria Army Air Base (later England AFB), Pollock Army Air Field, and reactivated Camp Beauregard. Camp Polk was located further west of Alexandria near Leesville. 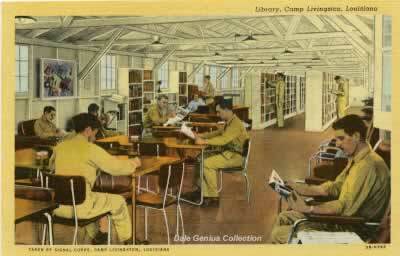 Camp Livingston was active during 1940-1945 and was a key element in the Louisiana Maneuvers. I clearly remember driving the abandoned roads of the camp with my father during the late 1950s as we journeyed from Alexandria east to Little River, Lonnie's Landing and Walker Lake. 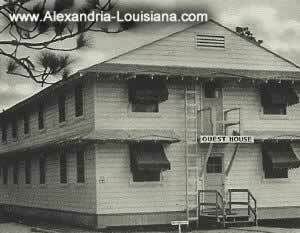 The camp was situated generally northeast of Alexandria, off U.S. Highway 165, and close to Camp Beauregard and Esler Field. 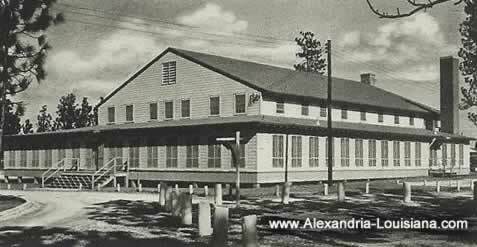 The other major area army facility, Camp Claiborne, was southwest of Alexandria. 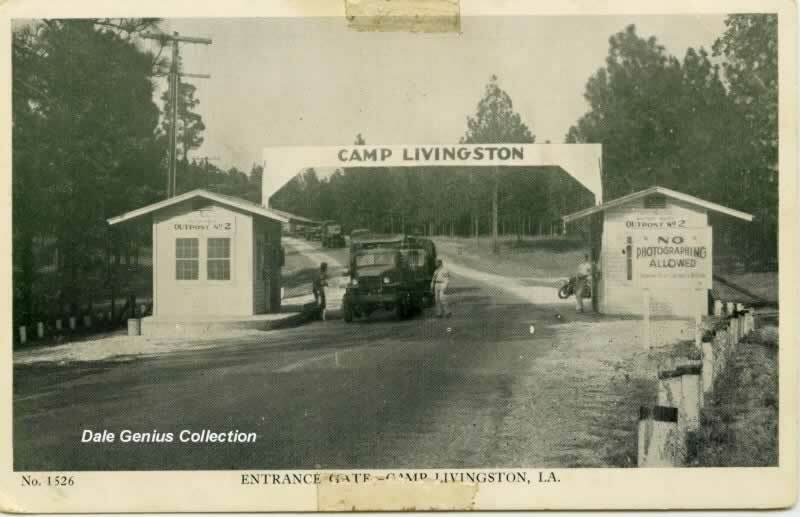 Camp Livingston was originally named Camp Tioga, but later renamed in honor of Chancellor Robert R. Livingston, a negotiator involved in the Louisiana Purchase. Robert was the brother of U.S. Senator Edward Livingston, who later served as U.S. Secretary of State. 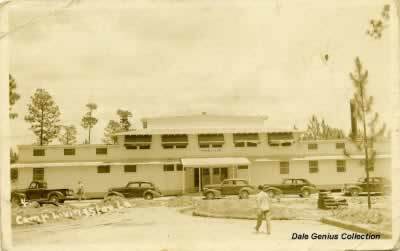 It was established as an infantry training facility, and construction began on September 16, 1940, requiring the use of 18,000 construction workers. About 6,800 acres of land were acquired in 1928 as an artillery range for nearby Camp Beauregard. 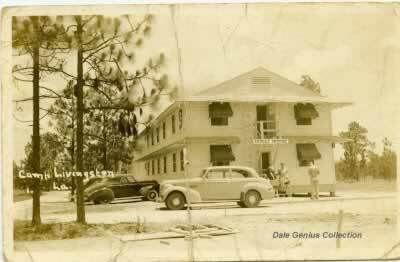 In the early 1940s, another 6,000 acres were acquired and added by Declaration of Taking to the formally established Camp Livingston. An additional 5,900 acres of land were secured from the Department of Agriculture, bringing the total acreage for Camp Livingston to over 18,000 acres. The camp included a hospital, incinerator, laundry, cold storage plant, motor repair shops, sewage disposal plant, utilities, water system, gas and electricity, four fire stations, paved roads, traffic lights and recreational facilities. 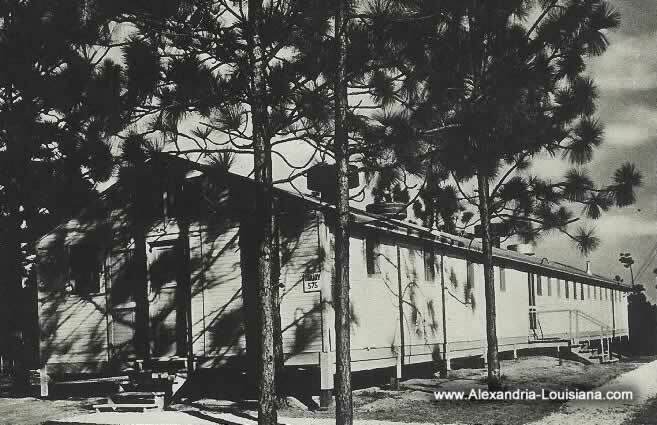 Camp Livingston provided thirteen religious chapels, service clubs, libraries, four War Department theaters, and a large all-purpose sports arena with roller skating, dancing, boxing, basketball courts and other team sports. 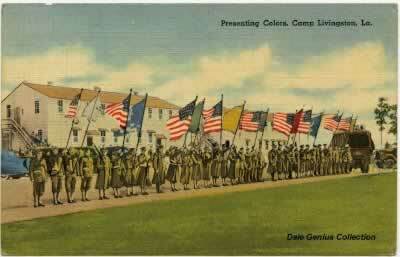 During its history, Camp Livingston trained hundreds of thousands of soldiers for combat. The camp's newspaper was the "Camp Livingston Communique". One unique feature of the camp was the "Snake House" to familiarize the solders with the many dangerous serpents found in the area. 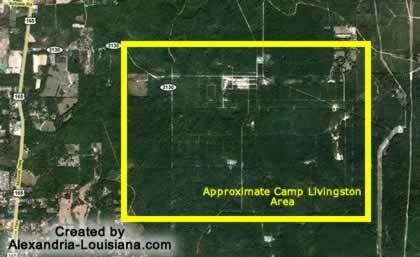 Another facility used by the camp was Breezy Hill Artillery Range, a 40,000 acre firing range about 20 miles distant, located north of Pollock and northeast of Dry Prong, Louisiana. 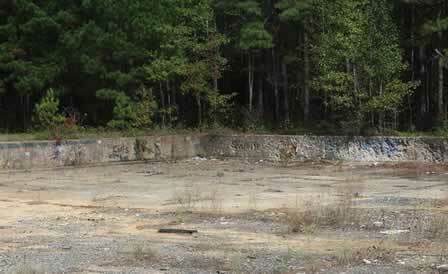 The site was used for artillery, mortar, anti-tank rockets, grenade and small arms training. Stationed at the Camp were the 28th, 32rd, 38th and 86th Infantry Divisions, along with various other field artillery, transportation, quartermaster, engineer combat, tank destroyer, ordnance and other Army units. While Camp Livingston was designated as an infantry replacement training center, as well as a garrison for these infantry divisions, it also included a POW facility housing Japanese, German and Italian prisoners of war. 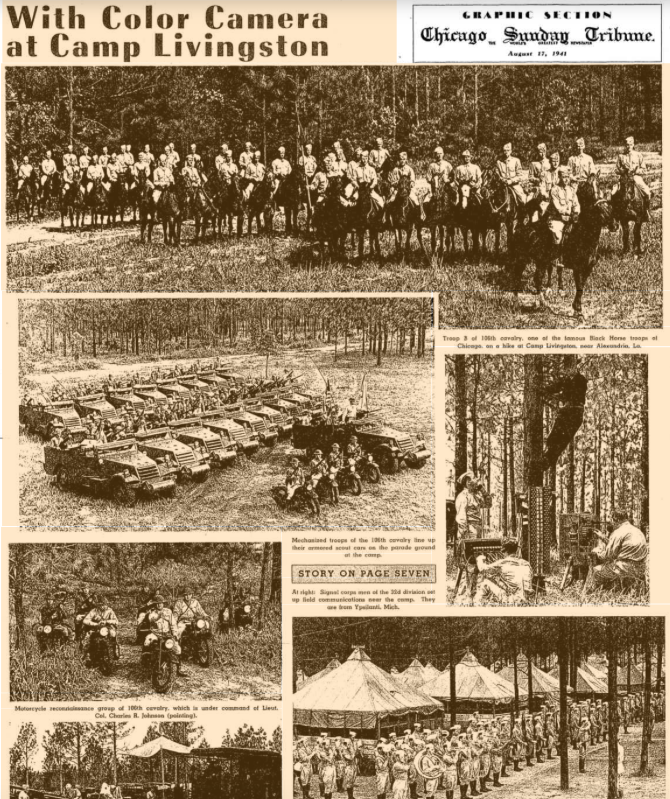 Situated about 12 miles north of Alexandria, La., on the edge of the Kisatchie National Forest, a vast expanse of rolling waste land, and bogs, is Camp Livingston, one of the major cantonments of the American army. 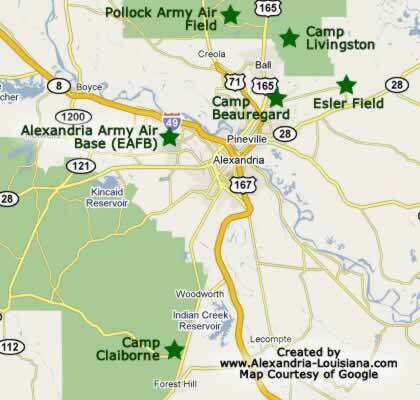 Alexandria, centrally located in the state, is the hub of a military area that embraces not only Camp Livingston but Camps Claiborne, Polk, and Beauregard and Esler field as well. Soldiers quartered in the camps of this area at the time that this was written numbered approximately 112,000, with about 26,000 more on the way there. The soldier population of Camp Livingston alone was about 27,500. 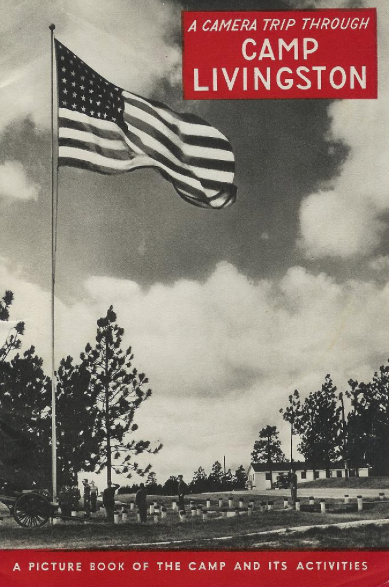 Construction at Camp Livingston began September 15, 1940, when approximately 9,000 workmen started clearing the land and erecting barracks and other buildings. Construction was carried on 24-hours-day-seven day-week, the workmen laboring in shifts to get the camp ready for the soldiers, who began arriving there around the first of the year. The total cost to the government for all the work clone to date is estimated al 25 million dollars. There are approximately 900 buildings on the camp grounds, and 7,850 tents. When the present program for recreational facilities Is completed each regiment quartered there will have a recreation building, two service clubs, and two tent theaters, each of the last named seating 2,200. East-West streets were identified with letters, with "A Street" being the northernmost street. North-South streets were numbered: 1st, 2nd, etc. The camp was organized into "Areas" numbered Area 1 through Area 20, basically in a counter-clockwise arrangement beginning in the northeast corner of the camp. Shown below is an aerial photograph of Camp Livingston in 1941, looking from the northwest to the southeast corner (courtesy of the Louisiana History Museum in Alexandria). 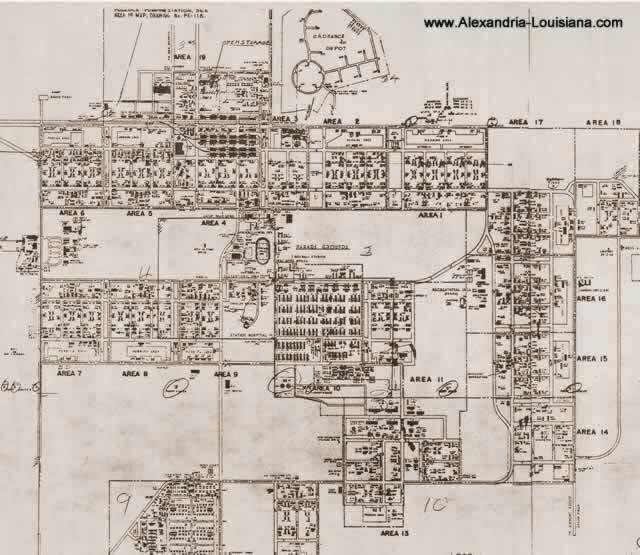 The various "areas" and overall street grid of Camp Livingston can be seen in the Camp Master Plan, Office of the Post Engineer, map PE-301 dated 1945 (shown below). The Google map below includes the approximate locations of the camp areas, streets, major buildings and features superimposed on a present day aerial view of the former camp. Compare with the original street grid above. Some locations and lines are approximate. Thousands of acres of rural land in Louisiana were selected by General Leslie McNair and Colonel Mark Clark to conduct maneuvers to train the United States' rapidly expanding military forces. The area ultimately selected to be used in the maneuvers extended over 2,400 square miles, from the Sabine River to the Calcasieu River and north to the Red River. During the Louisiana Maneuvers, Army strategists began by teaming division against division. Later the war games expanded to have corps fight against corps, and finally in the grand finale, Lieutenant General Walter Krueger's Third Army took the offensive against Lieutenant General Ben Lear's Second Army. Other key commanders included Col. Dwight D. Eisenhower, Chief of Staff, Third Army, and Brig. 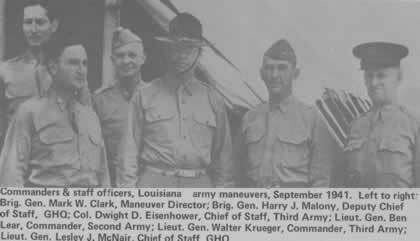 General Mark Wayne Clark, Maneuver Director, Omar Bradley, and George Patton, among other notables. The armies of two mythical countries were assembled, totaling about 400,000 troops: Kotmk (Kansas, Oklahoma, Texas, Missouri, Kentucky) and Almat (Arkansas, Louisiana, Mississippi, Alabama, Tennessee). Navigation rights for the Mississippi River was the reason for the "war". During the maneuvers, Army commanders were able to test and simulate a variety of offenses and conventional defenses with attacks from armored vehicles. Patton's tanks pushed back conventionally-armed defenders but failed to achieve a major, convincing victory. Army strategists also encountered recon and troop supply issues that would later be experienced in actual real-world battle situations, creating valuable experience for the Army prior to the U.S. entering the war. 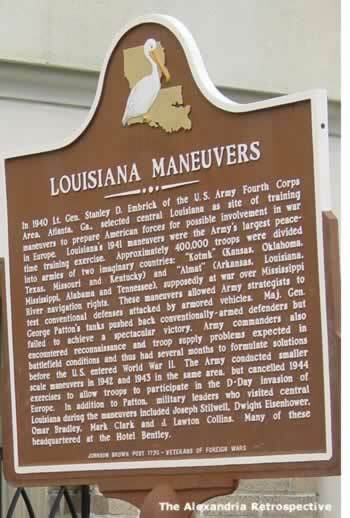 The Army conducted similar, but smaller, Louisiana maneuvers in 1942 and 1943, but cancelled exercises in 1944 so soldiers could be part of the D-Day invasion in Europe. Changes and impacts abounded in Alexandria as the war grew closer to the United States. Suddenly there was a shortage of many of the basics of life, and a system of rationing was inaugurated. Families were issued ration books with stamps good for certain items such as gasoline, tires, meat, and sugar. To speed military vehicles around the area, a new four lane loop named MacArthur Drive was constructed through what was farms and pastures on the western outskirts of Alexandria. It featured state-of-the-art traffic circles and interchanges. 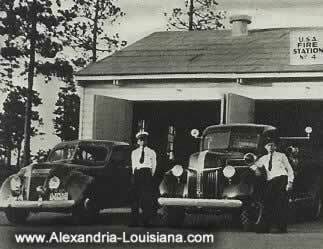 Gardner Highway (LA 28 from Alexandria to Leesville) became a straight paved highway, rumored to be an emergency airplane runway. Convoys associated with the maneuvers frequently moved around and through Alexandria, and residents reported waking up in the middle of the night and watching General Patton's tanks rumbling down city streets. Alexandria only extended a few blocks west of Chester Street, and the outskirts were favorite places for the Army to set up their 155 millimeter cannon and anti-aircraft installations. Sometimes soldiers would permit children to peek through their range finders and climb all over the cannons. Occasionally, opposing forces would engage in a battle and children would fill their pockets with spent blank rifle cartridges. 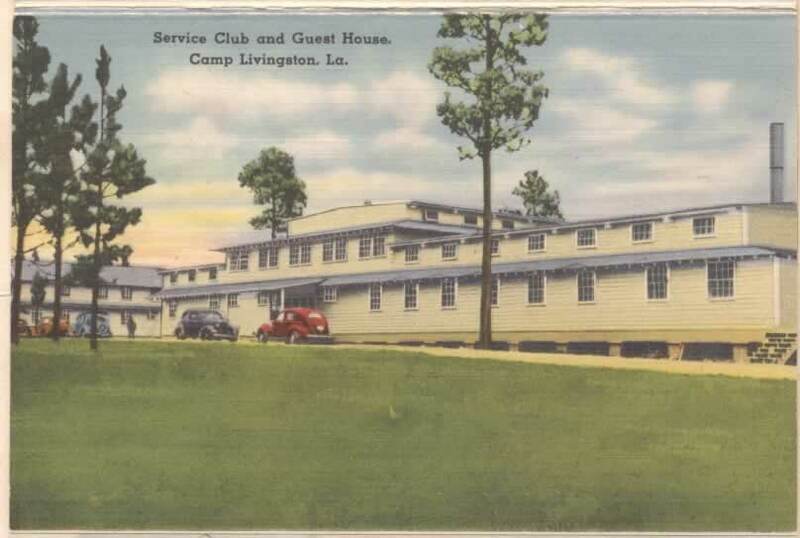 This website has collected a number of historic postcards and vintage photographs about Camp Livingston from the 1940s. In addition, several have been shared with permission from the Dale Genius Collection. These help us visualize what the Camp looked liked during the War, and tell amazing stories of the magnitude of the camp, and the lives of the people who served there. What's a Soldier to Do in Alexandria? The main place soldiers headed on leave, if their furlough wasn't long enough to reach home, was to the largest city in the area: Alexandria. "SOLDIER: Alexandria, Louisiana Welcomes You!" 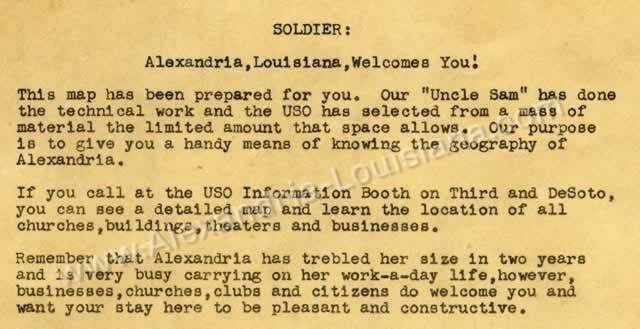 reads this USO Information Sheet and local bus map for WWII soldiers getting around to Alexandria churches, theaters, businesses and USO clubs. 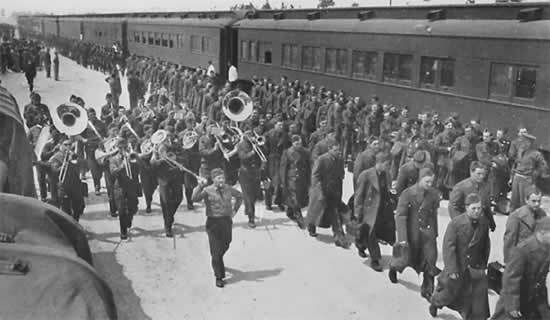 After the war ended in 1945, the Army began work to transition the camp back to civilian use. 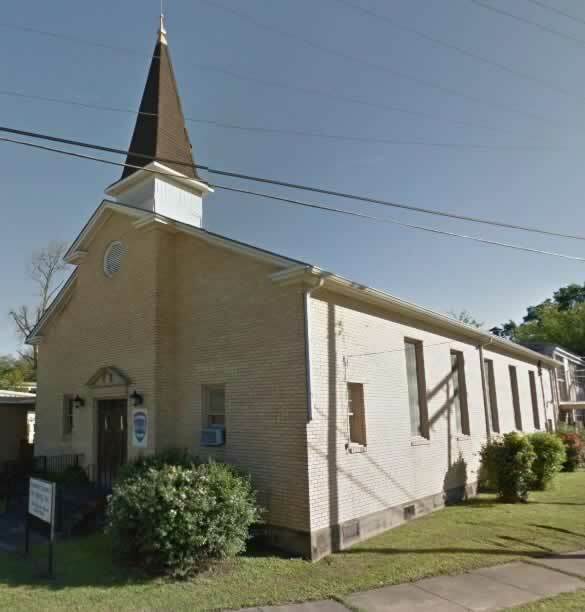 It was placed on inactive status by the War Department on September 25, 1946, and work began to demolish the buildings or mover them to schools, churches, and other uses in the surrounding area. Some camp buildings received a new life, like the chapel shown below, and continued in use in the Central Louisiana area. Actually, Camp Livingston had thirteen (13) chapels. They were strict "Army design & regulation" built from approved blueprints, non-denominational in that with minimal adjustment they could be used by Catholics, Jews or Protestants. Each chapel had a long nave that positioned the churchgoers far from the sanctuary. Trinity Methodist Church at 214 Chester Street in Alexandria secured a frame Army Chapel building from Camp Livingston which the church veneered on the outside with white Waskom brick (see photo to the right). The first Sunday service held in this new sanctuary was on November 15, 1948. The former chapel still stands in 2017, looking much like it did when it was at Camp Livingston during the early 1940s. It is now occupied by the Rapides Council on Aging (see below). 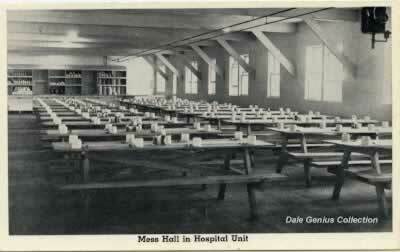 Other buildings, such as wooden barracks, were also moved and used for a number of years. 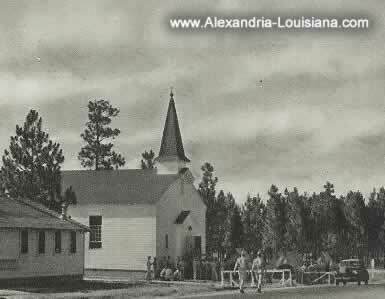 In 1948, Our Lady of Prompt Succor Catholic Church in Alexandria purchased its "Parish Hall" from the War Assets Administration, remodeled the structure, and made it serviceable for parish meetings and functions for many years. 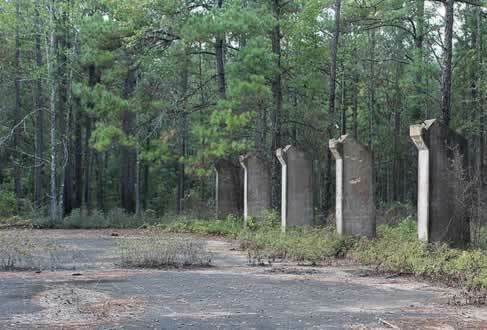 Today, the former camp area is administered by the U.S. Department of Agriculture, Forest Service, Kisatchie National Forest and offers biking, hiking, ATV trails and other recreational opportunities. To this day, roughly 75 years after the camp's construction, and subsequent abandonment after the war, evidence of its existence remains. Concrete streets and camp grid are still visible today from satellite photographs (see image below). Remnants of many structures can be seen today. 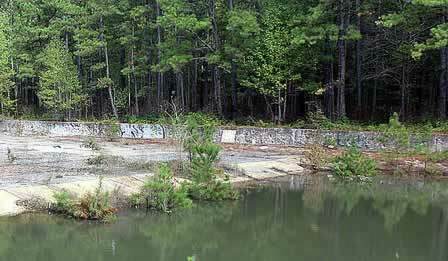 Foundations and concrete support pillars for warehouses and large buildings are still seen around the old camp, like shown in the scene below. Some of these swimming pools are still visible today, such as those shown in the photos below. 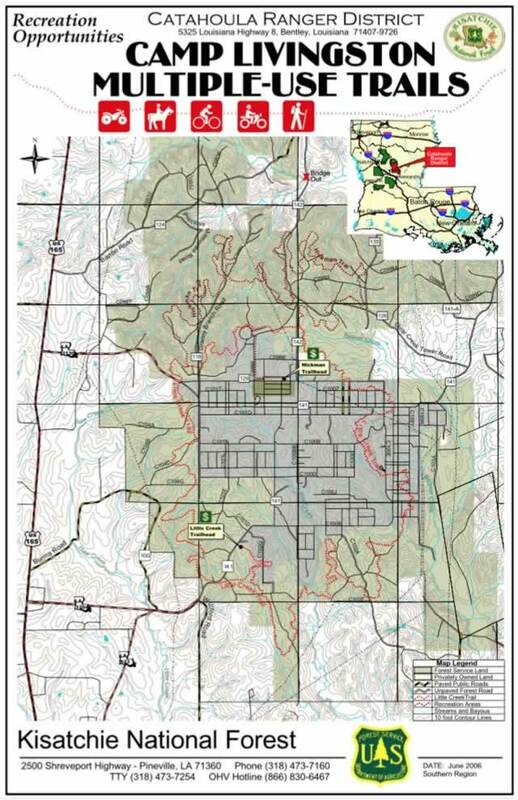 The Camp Livingston area today is administered by the U.S. Department of Agriculture, Forest Service, Kisatchie National Forest and offers biking, hiking, ATV trails and other recreational opportunities.